Nevertheless, although you may have used a String here and there, it’s time to unleash their full potential. Where do we find documentation for the String class? Although technically a Java class, because Strings are so commonly used, Processing includes documentation in its reference: http://www.processing.org/reference/String.html. This page only covers some of the available methods of the String class. The full documentation can be found on java’s String page. It appears from the above that a String is nothing more than a list of characters in between quotes. Nevertheless, this is only the data of a String. We must remember that a String is an object with methods (which you can find on the reference page.) This is just like how we learned in the Pixels tutorial that a PImage stores both the data associated with an image as well as the functionality: copy(), loadPixels(), etc. For example, the method charAt() returns the individual character in the String at a given index. Note that Strings are just like arrays in that the first character is index #0! Another useful method is length(). This is easy to confuse with the length property of an array. However, when we ask for the length of a String object, we must use the parentheses since we are calling a function called length() rather than accessing a property called length. We can also change a String to all uppercase using the toUpperCase() method (toLowerCase() is also available). You might notice something a bit odd here. Why didn’t we simply say “message.toUpperCase()” and then print “message” variable? Instead, we assigned the result of “message.toUpperCase()” to a new variable with a different name — “uppercase”. This is because a String is a special kind of object. It is immutable. An immutable object is one whose data can never be changed. Once we create a String, it stays the same for life. Anytime we want to change the String, we have to create a new one. So in the case of converting to uppercase, the method toUpperCase() returns a copy of the String object with all caps. However, technically speaking, when “==” is used with objects, it compares the memory addresses for each object. Even though they contain the same data — “hello”– if they are different object instances “==” could result in a false comparison. The equals() function ensures that we are checking to see if two String objects contain the exact same sequence of characters, regardless of where that data is stored in the computer’s memory. Although both of the above methods return the correct result, it’s safer to use equals(). Depending on how String objects are created in a sketch, “==” will not always work. One other feature of String objects is concatenation, joining two Strings together. Strings are joined with the “+” operator. Plus, of course, usually means add in the case of numbers. When used with Strings, it means join. Variables can also be brought into a String using concatenation. Or if you needed to determine that a certain part of the code was executed, you might print out a descriptive message. While this is valuable for debugging, it’s not going to help our goal of displaying text for a user. To place text on screen, we have to follow a series of simple steps. 1. Declare an object of type PFont. 2. Create the font by referencing the font name and the function createFont_(). This should be done only once, usually in setup(). Just as with loading an image, the process of loading a font into memory is slow and would seriously affect the sketch’s performance if placed inside draw(). You can see a list of your available system fonts by via PFont.list(). Because of limitations in Java, not all fonts can be used and some might work with one operating system and not others. When sharing a sketch with other people or posting it on the web, you may need to include a .ttf or .otf version of your font in the data directory of the sketch because other people might not have the font installed on their computer. Only fonts that can legally be distributed should be included with a sketch. In addition to the name of the font, you can specify the size as well as whether the font should be antialiased or not. 3. Specify the font using textFont(). textFont() takes one or two arguments, the font variable and the font size, which is optional. If you do not include the font size, the font will be displayed at the size originally loaded. When possible, the text() function will use a native font rather than the bitmapped version created behind the scenes with createFont() so you have the opportunity to scale the font dynamically. When using P2D, the actual native version of the font will be employed by the sketch, improving drawing quality and performance. With the P3D renderer, the bitmapped version will be used and therefore specifying a font size that is different from the font size loaded can result in pixelated text. 4. Specify a color using fill(). Fonts can also be created using “Tools” –> “Create Font.” This will create and place a VLW font file in your data directory which you can load into a PFont object using loadFont(). textAlign() -- specifies RIGHT, LEFT or CENTER alignment for text. textWidth() -- Calculates and returns the width of any character or text string. Let’s say we want to create a news ticker, where text scrolls across the bottom of the screen from left to right. When the news headline leaves the window, it reappears on the right hand side and scrolls again. If we know the x location of the beginning of the text and we know the width of that text, we can determine when it is no longer in view. textWidth() gives us that width. To start, we declare headline, font, and x location variables, initializing them in setup(). In draw(), we display the text at the appropriate location. Now comes more difficult part. It was easy to test when a circle reached the left side of the screen. We would simply ask: is x less than 0? With text, however, since it is left-aligned, when x equals zero, it is still viewable on screen. Instead, the text will be invisible when x is less than 0 minus the width of the text (See figure below). When that is the case, we reset x back to the right-hand side of the window, i.e. width. Here’s the full example that displays a different headline each time the previous headline leaves the screen. The headlines are stored in a String array. In addition to textAlign() and textWidth(), Processing also offers the functions textLeading(), textMode(), textSize() for additional display functionality. Translation and rotation can also be applied to text. For example, to rotate text around its center, translate to an origin point and use textAlign(CENTER) before displaying the text. The solution is to loop through a String, displaying each character one at a time. Let’s start by looking at an example that displays the text all at once. // Displaying a block of text all at once using text(). We can rewrite the code to display each character in loop, using the charAt() function. // The first character is at pixel 10. // Each character is displayed one at a time with the charAt() function. // All characters are spaced 10 pixels apart. Calling the text() function for each character will allow us more flexibility (for coloring, sizing, and placing characters within one String individually). The above code has a pretty major flaw, however — the x location is increased by 10 pixels for each character. Although this is approximately correct, because each character is not exactly ten pixels wide, the spacing is off. The proper spacing can be achieved using the textWidth() function as demonstrated in the code below. Note how this example achieves the proper spacing even with each character being a random size! // textWidth() spaces the characters out properly. This “letter by letter” methodology can also be applied to a sketch where characters from a String move independently of one another. The following example uses object-oriented design to make each character from the original String a Letter object, allowing it to both be a displayed in its proper location as well as move about the screen individually. 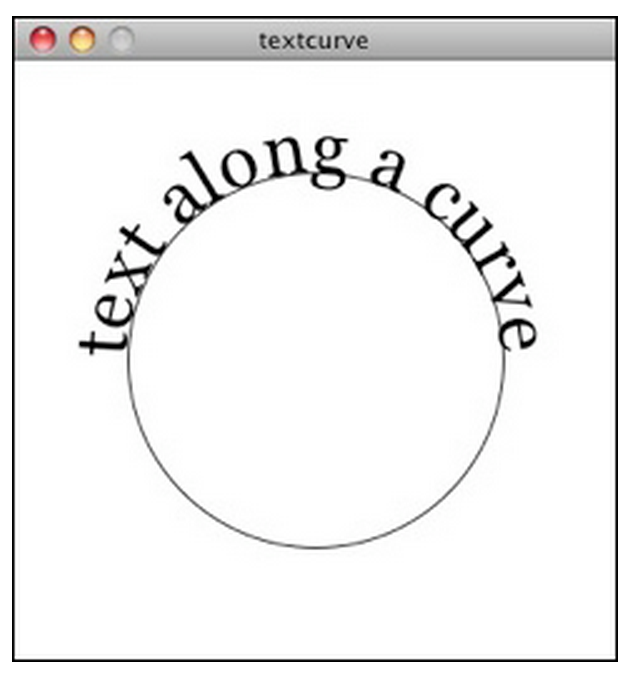 The character by character method also allows us to display text along a curve. 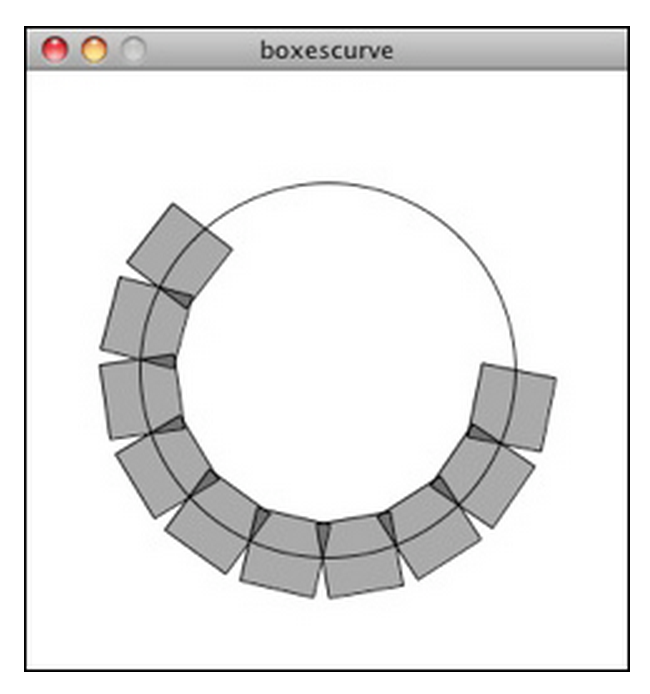 Before we move on to letters, let’s first look at how we would draw a series of boxes along a curve. This example makes heavy use of Trignometry. // Our curve is a circle with radius r in the center of the window. What we need to do is replace each box with a character from a String that fits inside the box. And since characters all do not have the same width, instead of using a variable “w” that stays constant, each box will have a variable width along the curve according to the textWidth() function. Select a noun and an adjective. Animate the noun to reveal the adjective. Select a verb and animate each letter of the word to convey its meaning.